Fall is here, summer is over, there is no denying it. Everything is changing and the Fall colors are moving in. On the last day of August we had a steaming hot day. Now it is raining and the cool has moved in. I must admit I am ready for it. For me Fall begins at September 1. whether the calendar says so or not. Summer has been great. Long and hot, busy and relaxing at the same time and filled with wonderful things I will have to tell you all about. I didn’t plan or expect to leave you all for so long. Somewhere at the end of Spring I got sick, after a pretty stressful period. It took me a long time to fully bounce back. By that time the end of school year craziness was upon us and summer had truly arrived. And somehow between hammock lounging, al fresco dining, traveling across the globe, playing backyard tourist, thrifting and shopping, painting and web-designing and a lot of doing nothing at all, my blog got quiet, real quiet. And now it is Fall. Time to replace the cool drinks with nice, warm and comforting drinks. My tops all have sleeves again and I have started to wear socks. The plaid has been washed and put back on the couch for warm snuggly evenings to come, the gathering of pinecones has commenced and so has the scattering of candles around my living room. I am ready for Fall. Bring it on! Come September a new (school) year starts. In my day-time job a new exciting, challenging and somewhat scary period begins. And here in my on-line alternative life new and exciting plans are being hatched as well. I so love Fall. 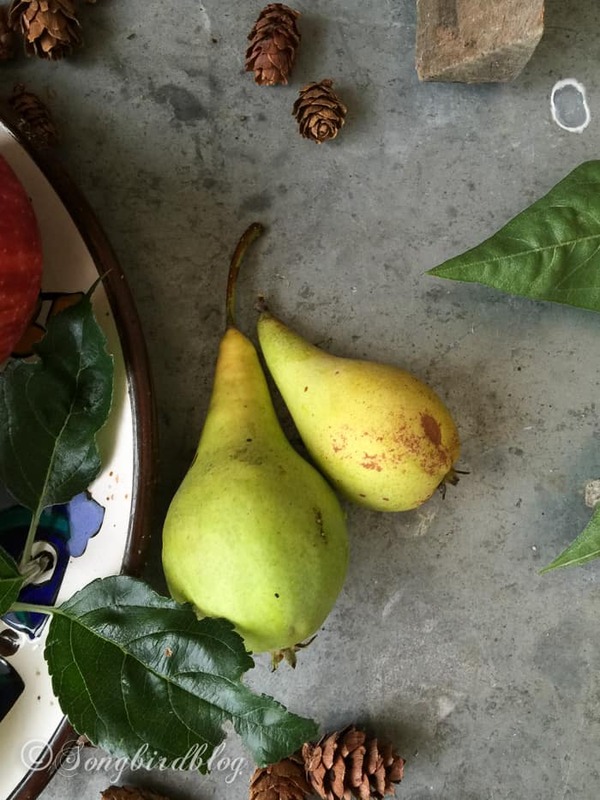 The Fall colors, the crispness, the gift of unexpected warm sunny days, the wild abandon of stormy nights, the falling leaves, the business of nature as it gets ready for the big sleep, hot cocoa and fresh apple pie, boots and scarves, long walks through muddy woods and sipping tea by an open fire. My garden has been good to me. It was once again sadly neglected and yet it gave me sun flowers and poppies, apples and tomatoes in abundance, roses to bring inside and fragrant lilacs to perfume my home. As always I have plans for this garden of mine. One day it will no longer be neglected. Maybe this Fall, I will make a start…. oh, yes…. I’m very ready! Unfortunately, in south texas fall doesn’t really start until winter. We still have temps in the mid 90s this week. So, although the heat is less than a few weeks ago, it’s still hot and humid. We’ve had a few mornings in the mid 60s and that has given me a peek of what is to be. LOVE those little pinecones ! Glad to see you back ! Hi Patty, Glad to be back. Good luck with all that hot weather. I am truly grateful for living in a climate with four seasons. Even if that means that sometimes those seasons are out of whack and it might be Fall in summer or Spring in winter. I did study and gaze at this post yesterday and enjoyed the pine ones gathered and scattered and mixed with apples! How lovely it all looks upon a galvanized metal backdrop. Just a simple way you have where your picture paints a thousand words!! It is to be 97F here today so I think it is summer for a bit longer?. Oh I see a reader in Texas repeating me! But Christmas is in all the stores now so I have pulled out my birch candles….does that count as fall decor!! And the school bus rumbles down my street with eager morning laughs and then home with hot and tired faces. School marks fall for me!! Marianne, so glad to see you back, and so happy that you’ve had a good summer and that you were out enjoying yourself during your down time. I feel the same way about Fall, and you expressed my feelings exactly, but I will have to wait until October to get the same Fall weather that you are having now. I am very much looking forward to it. Beautiful pictures, by the way. Just lovely. Marianne, no new post on the blog today, so I re-visited this one. It is a misty, moisty October day in the Missouri Ozarks, and while the leaves have not yet completely turned to their bright autumn colors, there is a lot of yellow mixed in with the greens and browns in my back yard. 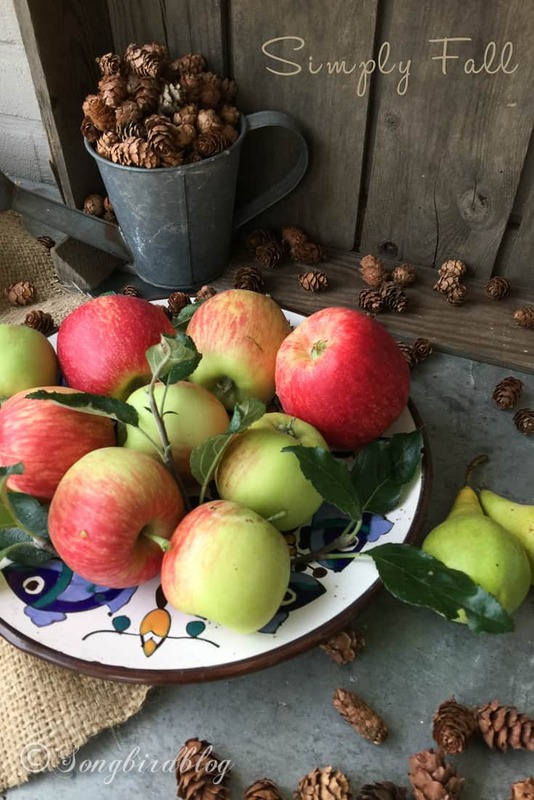 I came back to this post because it just cries Autumn to me, the colors, the apples and pears, the old galvanized watering can full of pine cones. I love this time of year and you captured it so beautifully. In another week or so, our trees will be fully red, or orange or yellow. There won’t be so much green, and then the leaves will fall and there will be bare branches against the winter sky. Hope you are enjoying this lovely time of year while it lasts. And thanks again for this lovely post.